The Welsh Government wants to build a three lane motorway across the Gwent Levels from Magor to Castleton. The Public Inquiry into this appalling proposal started in February 2017 and continued until the end of March 2018, including a break while the Welsh Government secretly negotiated a £200 million compensation package to persuade Newport Docks to withdraw their objection. The proposed route can be seen on the map below. Note the impact on the SSSI (green) and the River Usk, which has European level protection. 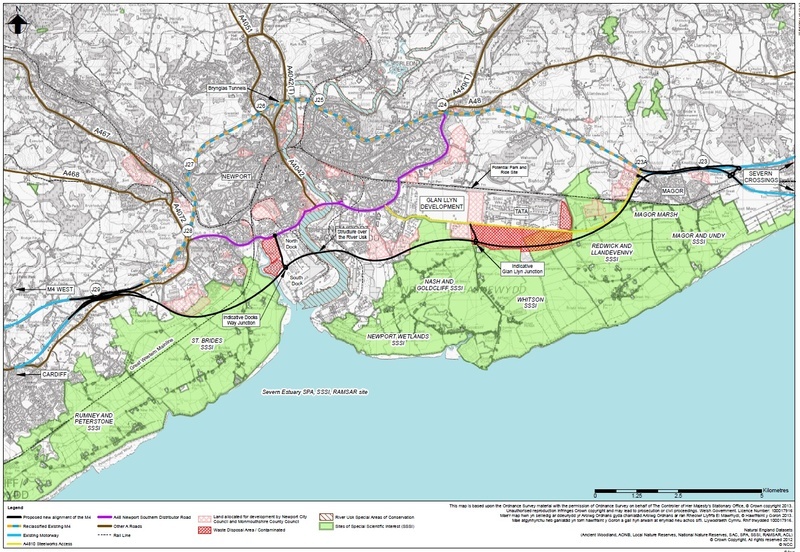 Also note how development is already proposed on the SSSI to the north of the route. The Welsh Government has spent over £44 million so far on trying to justify this scheme (money which could’ve done so much for sustainable transport around Newport) – their website for the project is at www.gov.wales/m4newport. You can help — take action now! If you support our positive, cost-effective alternatives and don't want a motorway through the Gwent Levels, please visit our take action page.